ACCRA, <?xml:namespace prefix = st1 ns = "urn:schemas-microsoft-com:office:smarttags" />Ghana - The ring Osman Mustapha wears on his right index finger was too tarnished to reflect the harsh African sun that pushed his eyes into slits and drew beads of sweat from his brow. That small piece of silver, though only a trinket, was a matter of both pride and principle to Mustapha as he studied it from the schoolyard. Such talismans are not unusual in Ghana, where roughly 12% of the population still identifies itself with traditional African religions. But on the finger of a Muslim, Mustapha’s ring is a prime example of what Wahabia, or more puritan Muslims, might call a corruption of Koranic law, and an example of how Ghanaian culture can stand at odds with Islam. 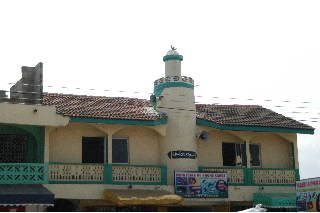 For decades, the Wahabia in Ghana, represented by Ahlus Sunna Wa’al Jama’at since 1997, have cultivated a complex infrastructure of international scholarships to send high-performing Muslim students to countries such as Saudi Arabia, Kuwait and Qatar, where, as Abban put it, they can receive an education in proper Islam. Since the need for higher education in Ghana greatly exceeds its availability, students who can afford it often travel abroad for education. But these scholarships are believed by some to have implicit strings attached. “All Ahlus Sunna, they come from Saudi Arabia. They are the Wahabia. You go and come back to tell people that some of our African culture is bad. They tell you that in Saudi Arabia,” Mustapha said. Scholarships arranged through Ahlus Sunna Wa’al Jama’at are generally given by universities in the Middle East, and can cover tuition, living expenses and an annual plane ticket home for up to 10 years. Upon returning to Ghana, these graduates often take up positions of prominence within the Muslim community, and are relied upon as teachers. “It is one of our principles to educate Muslims on how their religion must be practiced. When you have a culture that is against the teachings of the Koran, you must take out that culture,” Abban said. Ahlus Sunna Wa’al Jama’at publicly condemns traditional Ghanaian funeral celebrations, which can be elaborate and lengthy affairs, as well as the use of traditional charms and amulets, certain tribal healing methods, veneration of sheiks and celebrations of the prophet Mohammed’s birthday. While Abban did not condemn all elements of African culture, he said that true Islam simply does not allow for certain aspects of it. He “believes that Islam should be practiced according to the tradition of the prophet. No additions, no abstractions, no interpretations. Lacking reputable Islamic universities in Ghana, Abban will continue to encourage as many students to study abroad as scholarships from foreign benefactors allow. Prof. Nathan Samwini of the Kwame Nkrumah University of Science and Technology pointed to the oil boom as one of the primary reasons for fund availability. “How much is a scholarship for one, or even 10 students, to an oil-rich country, if it means spreading your religious beliefs? I still have yet to figure out exactly where the scholarship money comes from, and no one has been able to properly explain it to me,” Samwini said. Even leaders of Ahlus Sunna Wa’al Jama’at cannot pinpoint the exact source of the money. They are simply notified of how many scholarships have been awarded to Ghana, and are then left to distribute them. Abban suspects these might come from the universities, as part of a budget for helping underdeveloped countries. Since Ghana received its independence from Great Britain in 1957, it has seen steadily increasing support from the Middle East, beginning with the opening of the Egyptian and Saudi Arabia embassies in Accra in the 1960s. The involvement of various Middle Eastern countries in Africa, however, is not solely confined to education. “Saudi Arabia, Iraq, and Kuwait are all invested in helping the poor,” said Sheik Mustapha Yaajalal, the proprietor and founder of the Islamic Training Institute. His school has flooded and collapsed five times since its construction in 1984, and each time Yaajalal received both financial and volunteer aid from Iran to help him to reopen it. The mosque behind the school where he leads prayer every Friday was a gift from Kuwait. While grateful for the foreign aid, Yaajalal said that his theology would be harshly criticized in the places from which he received so much help. “Sufis must live in secret when they go somewhere like Saudi Arabia,” said Yaajalal, a Sufi himself, and a firm believer in many of the practices that are condemned by Wahabia. The 1980s and 1990s saw a great deal of tension between Ahlus Sunna Wa’al Jama’at and Tijaniyya Muslims, the other sizeable Islamic sect in Ghana, and Samwini said that the heavy influence of students returning from the Arabian Peninsula probably ignited the violence. “Those who integrated back into society did not get along. Thankfully they have mellowed and the violence has subsided, but the sects still do not get along,” he said. Over the last decade, Ghana has seen very little religious violence, and Samwini said that Muslims here have developed the ability to co-exist — so it would be difficult for extremist factions from the Middle East to transplant themselves here. “This is not a country where hot-headed Muslims can survive. The tolerance level here is unparalleled in all of West Africa,” he said. That peaceful co-existence that has prevented major violence in Ghana since the mid-1990s is also what he hopes will prevent organizations like Al-Qaeda from establishing a presence in Ghana. Yet tension remains between different sects that wish to see African Islam chart a particular course. Osman Mustapha is a prime example. “I believe everything from the Koran. But there are some things they will not show a man in Saudi Arabia. They do not know the secrets of the Koran. You will find those in Africa,” he said.